Grounded Theory is by far the most widely used research method across a wide range of disciplines and subject areas, including social sciences, nursing and healthcare, medical sociology, information systems, psychology, and anthropology. 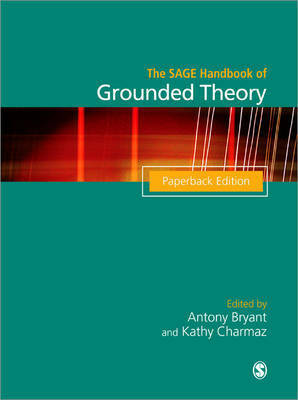 This handbook gives a comprehensive overview of the theory and practice of Grounded Theory, taking into account the many attempts to revise and refine Glaser and Strauss' original formulation and the debates that have followed. Antony Bryant & Kathy Charmaz bring together leading researchers and practitioners of the method from the US, the UK, Australia and Europe to represent all the major standpoints within Grounded Theory, demonstrating the richness of the approach. The contributions cover a wide range of perspectives on the method, covering its features and ramifications, its intricacies in use, its demands on the skills and capabilities of the researcher and its position in the domain of research methods. The SAGE Handbook of Grounded Theory is an indispensable reference source for academics and researchers across many disciplines who want to develop their understanding of the Grounded Theory method. Antony Bryant is currently Professor of Informatics at Leeds Beckett University, Leeds, UK. He has written and taught extensively on research methods, with a particular interest in qualitative research methods, and the Grounded Theory Method in particular. His book Grounded Theory and Grounded Theorizing: Pragmatism in Research Practice was recently published by Oxford University Press (2017). He is Senior Editor of The SAGE Handbook of Grounded Theory (SAGE, 2007) and The Sage Handbook of Current Developments in Grounded Theory - both co-edited with Kathy Charmaz (SAGE, 2019). He has supervised over 50 doctoral students, and examined many others, in topics including formal specification of software systems, development of quality and maturity frameworks, new forms of business modelling, and various aspects of e-government and e-democracy. He is currently working with Professor Frank Land, who worked on the first commercial computer (LEO 1951), and was also the first UK Professor of Information Systems, on a series of `conversations' planned for publication that will cover issues in the development and impact of computer technology since the 1950s. Kathy Charmaz is Professor Emerita of sociology and the former director of the Faculty Writing Program at Sonoma State University. She joined the first cohort of doctoral students at the University of California, San Francisco, where she studied with Anselm Strauss. She writes in the areas of social psychology, medical sociology, qualitative methods, and grounded theory and has written, coauthored, or coedited 14 books, including two award-winning works: Good Days, Bad Days; The Self in Illness and Time, and Constructing Grounded Theory. She received the George Herbert Mead award for lifetime achievement from the Society for the Study of Symbolic Interaction, the Leo G. Reeder award for distinguished contributions from the Medical Sociology Section of the American Sociological Association and the Lifetime Achievement award from the International Congress of Qualitative Inquiry. Professor Charmaz gives workshops on qualitative methods, grounded theory, symbolic interactionism, and scholarly writing around the globe.